Today our urban public spaces are undergoing major changes due to densification, commercialization, and new technological behaviors. Standardized collection of big data means that the lives of ordinary people are being traced, documented, and archived. Increased surveillance lead to crimes against integrity. In this unstable world, the hidden and secretive has gained new and actualized value. Throughout the course of this project, we will work in vaguing the private and the hidden; the closed and open spaces of urban territories. Building upon artistic processes and materials related to everyday life, we will discover tactics to produce surprising and self-organizing sound. Our goal is to create gaps where interaction and vague communication can occur in public space. The Hidden project is an inquiry into everyday activities with a particular interest in the listening/sounding habits in public spaces. During our experiments we have invited people of all ages to engage in the production of polyphonic mesh-up sound using our vague methodology. 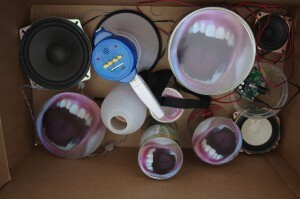 Vaguing outdoor sound production is part of creating resistance to surveillance. The entangled interrelation between the hidden and openness, both part of surveillance practice, is the background of the project and of the experiments. For the Hidden experiment, the norms of on/off, sound-making/listening and artist/audience are particularly vagued and subverted.